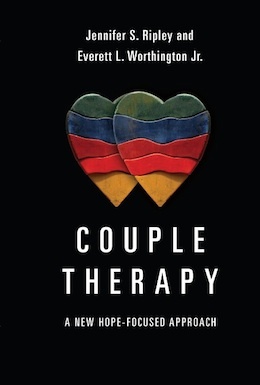 Leader Manual (and Cue Sheets) and Participant Manual for being a consultant to a couple who wants to improve their marriage through learning Forgiveness and Reconciliation through Experiencing Empathy (FREE). Leader Manual (or graphics-free version of Leader Manual) and Participant Manual for being a consultant to a couple who wants to improve their marriage through learning Handling Our Problems Effectively (HOPE) for Use with Couples. Here are Assessment Instruments and an example Assessment Report, complete with permission to adapt. For additional resources on the Hope-Focused Approaches—such as training videos, written and other resources for lay people and professionals—see the Hope Project web page, created by Dr. Jennifer S. Ripley. In addition, we have provided a summary of research and writing on the Hope-Focused Approach and on the forgiveness program to REACH forgiveness.